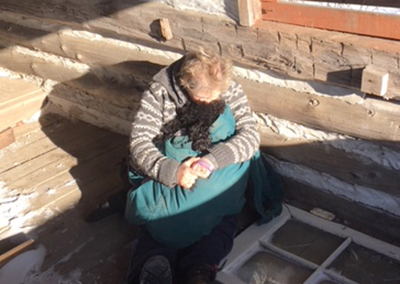 A “devastating experience” for one local resident had a rare, happy ending recently when a dog and its owner were finally reunited following five long, lonely nights alone. Speaking to the Citizen last week, Caledon resident Norma Grant recounted the story of how her 10-month-old poodle Sierra was spooked by “what she surely must have thought was a bear” while they were out on a trail in the Glen Haffy Conservation Area, near Mono Mills, leaving her owner’s side and running for her life. “That particular day there were three of us out hiking. I had two dogs with me, Sierra was one of them. We came across some other hikers and they had another dog that was absolutely massive, very hairy and caramel-coloured. It took me by surprise, but it really freaked Sierra out. I’d never seen her react like that to another dog before,” Ms. Grant recalls. While the other dogs out on the trail with Norma and her friends followed suit in running, they all stopped short of the tree line – all but Sierra. From around 2 p.m. on New Year’s Day until midnight, Norma combed the area in which Sierra ran to no avail. Frantic and emotional, Norma was forced to call it a night with temperatures depleting and no Sierra in sight. Once home, Norma rushed to her computer so that she could alert her friends on social media. Less than 24 hours later, that post had shared more than 1,000 times, putting friends, family and even strangers on alert as they searched for Sierra. Before too long, local pet recovery team Aid for Paws was on the scene assisting with the search. There was a sighting on Jan. 2 and again very late in the evening of Jan. 3, but Sierra managed to evade those trying to help her. France Lajeunesse heads up the five-person group Aid for Paws. When she was notified of the developing situation, she and the other members of their group immediately set about helping. That involved social media management, posters being put up throughout the community and educating those who volunteered to help with the search on what they should and shouldn’t do when trying to find Sierra. Following a few more days of work, the team received word of another sighting early on the morning of Jan. 6. Norma was immediately on site, eventually finding Sierra holed up in a shelter roughly five kilometres from where she had vanished. “We thought she might be inside, so I very slowly approached, quietly calling out Sierra’s name. As I entered, she was in my sights. She stood there looking at me and there were two exit points – I stood in one of them, and the other was to Sierra’s left. Even though she could see me and hear me, I could see she had one eye on that door. Thankfully she gave me a chance and collapsed right in my hands,” Ms. Grant said. She called their reunion a “miracle”, something Ms. Lajeunesse agreed with. Since Aid for Paws officially launched a little over 2 1/2 years ago, they had averaged between 50 and 75 investigations per year, boasting a success rate of approximately 80 percent. While she is thankful to have Sierra back in her life, Norma is convinced there would not have been a happy ending had it not been for France and her team. As such, she strongly recommended anyone searching for a lost pet get in touch with the organization and make use of their “incredible expertize”. “These people are in our community and are ready to help people. They don’t charge, they’re just here trying to serve the community and help people through situations like this,” Ms. Grant said. It’s been a busy time of year for France and her group, which now boasts one more member after Norma volunteered to join. They have been involved in searches all over Dufferin County and, more recently, have even ventured out as far as Wasaga Beach to help reunite pets and their loved ones. While the team is always happy to help in any situation, France has just one request for people in the community should they take their pet out for a walk. For more information on Aid for Paws, visit facebook.com/aid4paws.